We make chocolate from bean-to-bar in small batches using ethically sourced cacao. 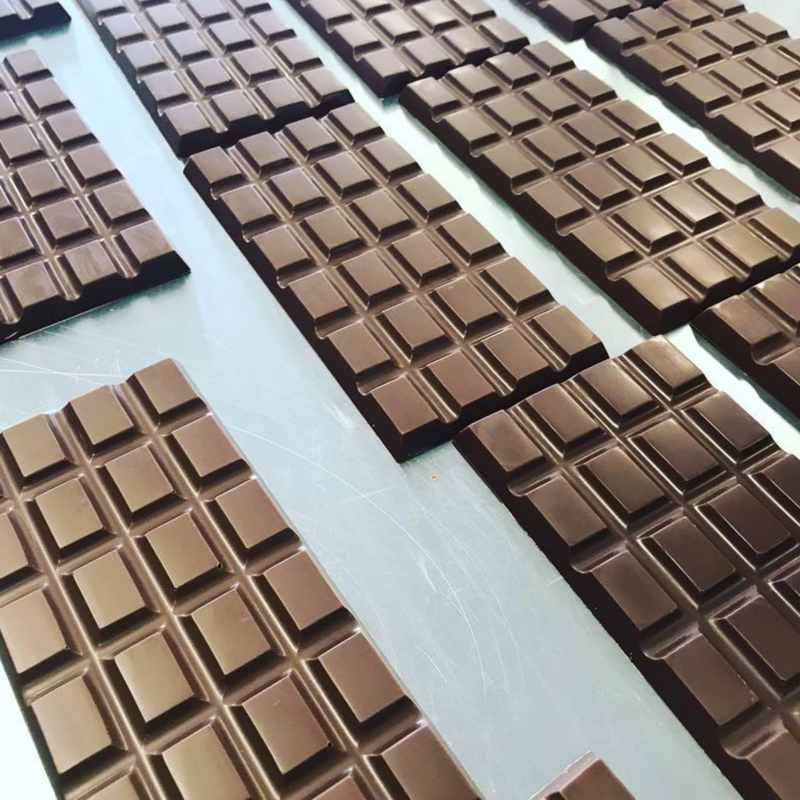 Most of our bars are made with just TWO ingredients: fine cacao, and organic cane sugar. Roasted and hulled cocoa beans, ready to grind into pure delicious chocolate. 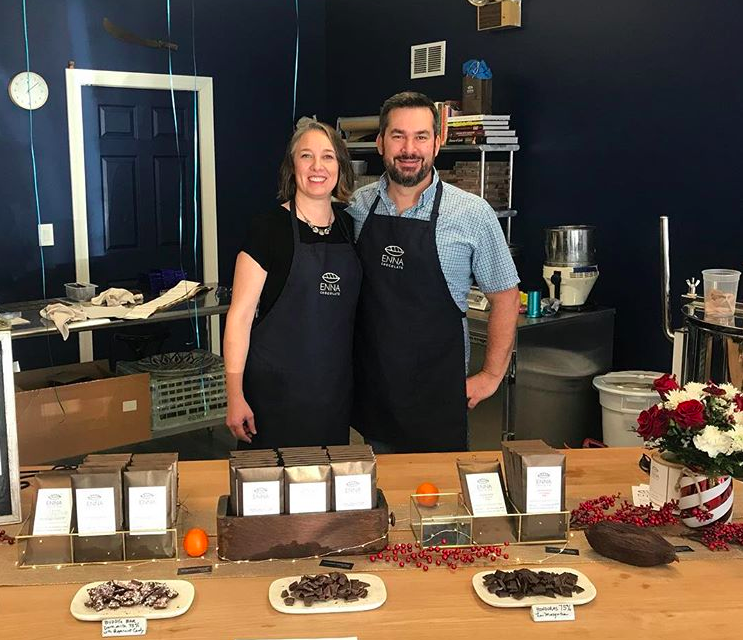 Our mission is to make delicious chocolate with cacao from unique origins and share its very special flavor with you. Fine chocolate flavor occurs at the intersection of art and science, and these two realms are equally fascinating! The chocolate-maker must use her palate and knowledge to finesse the best flavors out of her beans: balancing acidity, astringency, bitterness, earthiness, and other elements. Every bean, with its particular combination of genetics, terroir, and fermentation, along with our processing, carries potential for incredible flavor. While Enna’s chocolate is made with just cacao and pure organic cane sugar, plus a smidge of cocoa butter, you may swear you taste more: lemon, cinnamon, rum, green grass, raspberry, apple, tobacco, mandarin, lapsang, fig, mushroom, jasmine, wintergreen, licorice, cedar… are just some of the flavor notes that can be discovered in fine single-origin chocolate. We sort the cacao carefully and then roast it to bring out the best flavors. After the cacao is roasted, we crack and winnow to remove the husks. Beautiful cocoa nibs ready to be ground into pure chocolate. We grind our chocolate in a stone-wheel melanger for up to 4 days. While chocolate waits to be tempered into shiny bars, it develops beautiful crystallization patterns. Just like fine wine grapes, every cacao variety produces very different flavors. Our cacao is grown on farms where the crafts and science of cacao growing, harvesting, and fermentation are being preserved and carefully refined, leading the way in the world of fine chocolate. Each bean Enna works with carries an exciting story of sustainable and ethical farming and commerce. Pictured: a cacao farmer in La Mosquitia, Honduras.